It’s curious what people get attached to. Despite the huge number of changes to the photography apps in Apple’s iOS 8, a controversy has erupted over a single, universally loved feature — the Camera Roll, and Apple’s decision to remove it from the Photos app where it has resided these many years. The Camera Roll was not only a way for the app to organize photos, it became a part of the lexicon, with its own identity. I believe people related to the Camera Roll because it had a clear and unambiguous meaning: The Camera Roll means all your pictures. And now it’s gone. 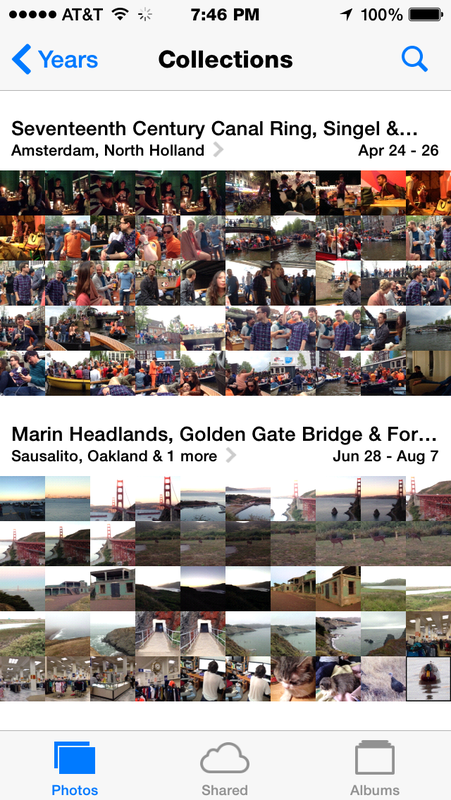 The camera roll let you see all your photos in one place and people liked that — a lot. Im so upset they took the camera roll out. I had pictures of when my son was first bor. till now! I hate that it’s just in my collections I want it back the other way. This is really turning me Apple and making me think of switching to a android and I have been a apple user for five years. Fix this please! I want the Camera Roll back! I don’t like these new folders! I loved the simplicity of the Camera Roll and the Videos folder! We don’t need anything else! Bring back the camera roll!!!!!!! I want to differentiate between photstream pics, and pics Ive taken on my phone. This is stupid, and Apple has messed this one up!! I want the camera roll back, this is just making things more difficult. And this was just for my story. Check the Twitter #cameraroll hashtag for even more Camera Roll angst, not to mention the Apple support forums. Why the outcry? After all, Apple changes software interfaces all the time — that’s the nature of progress in the tech industry. 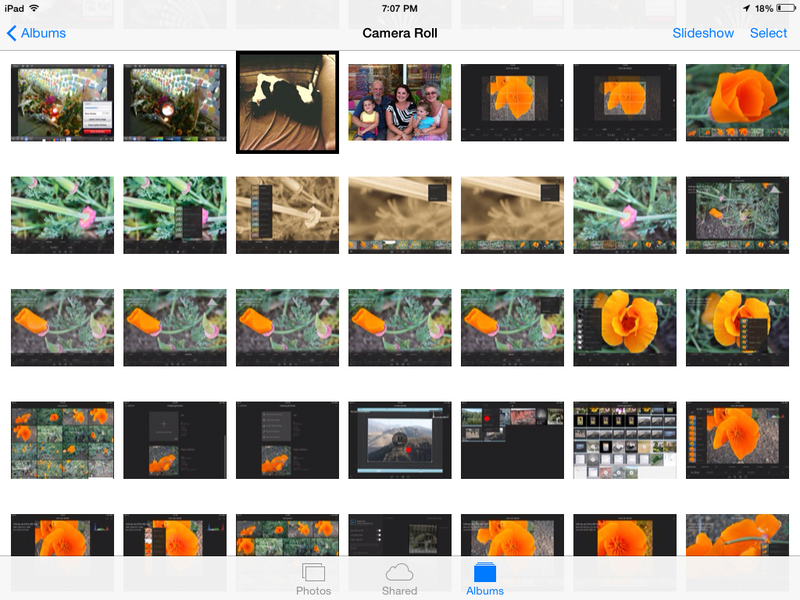 Many longtime users of Apple’s Photos app no doubt were upset for conceptual reasons. Camera Roll just has that ring to it — it’s a picture you see in your mind’s eye that perfectly expresses its concept, as well as being easy to remember. I had to consult my phone more than once to double-check that new top folder is now called Recently Added. In iOS 8, both Camera Roll and Photo Stream albums are now gone, and other new default albums have replaced them. In addition to Recently Added, you’ll see the new Favorites, Time-lapse, Recently Deleted and Hidden (which appears only if you hide a photo). 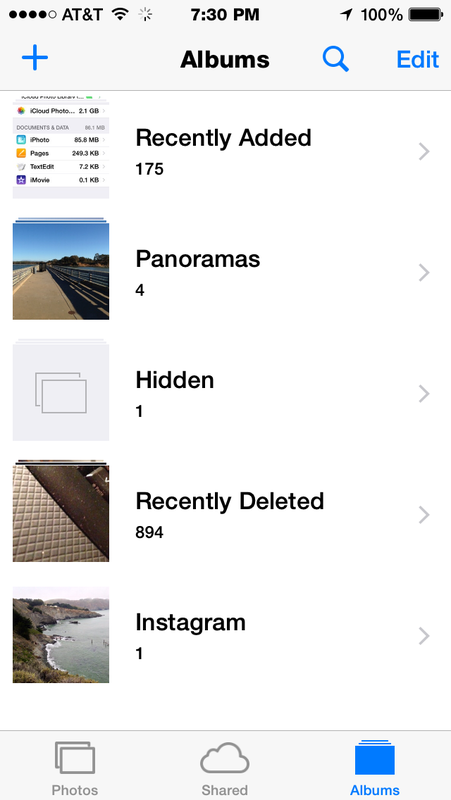 The Panoramas and Videos folders from iOS 7 are still with us, as are albums that you or your photo or video apps independently created. The Camera Roll has not been replaced, per se. With iOS 8, Apple has altered the way it shows you your pictures, and is marking that difference with a new — albeit tin-eared — name. All your photos are in the Moments and Collections views and should be easier to find. The oldest photo in my Recently Added folder, for example, is dated August 19, about 1 month ago, whereas my Photos folder contains pictures dating back to January. Whereas the Camera Roll showed you all your photos in one continuous album, to see that entire collection now, you’ll go to the Collections or Moments panes, where images are conveniently organized by date and location. Everything you’d see in the old camera roll is still there, and specific shots are likely easier to find, at least in the app. However, third party-apps iPhone apps like Facebook and Twitter will access the Recently Added folder by default, not Collections, giving you only newer images to post. The new iCloud Photo Library replaces the familiar Photo Stream, and it is designed to let you access all your photos, organized consistently, across all devices — not just the last 1000 of them. Setting up the iCloud Photo Library on the iPhone. If enabled, the iCloud Photo Library automatically stores all photos and videos in iCloud at full resolution in their original formats, including Raw. When the Photos app arrives on Mac OS X in 2015, you will also be able to upload and view photos from your Mac. 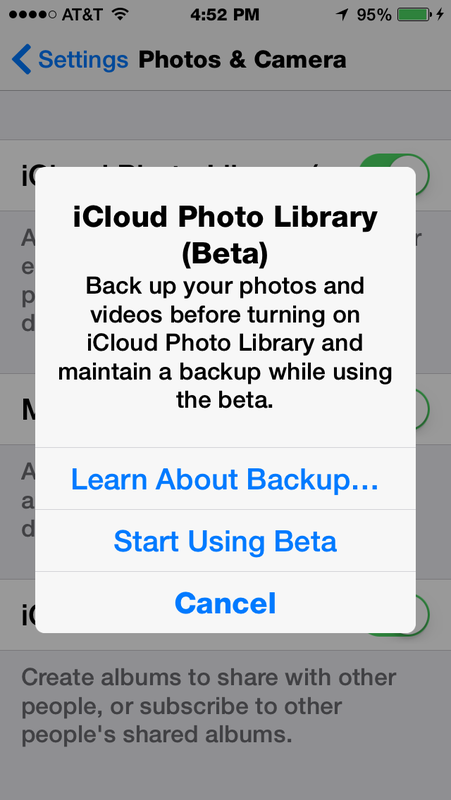 Today, the iCloud Photo Library is technically still in beta. 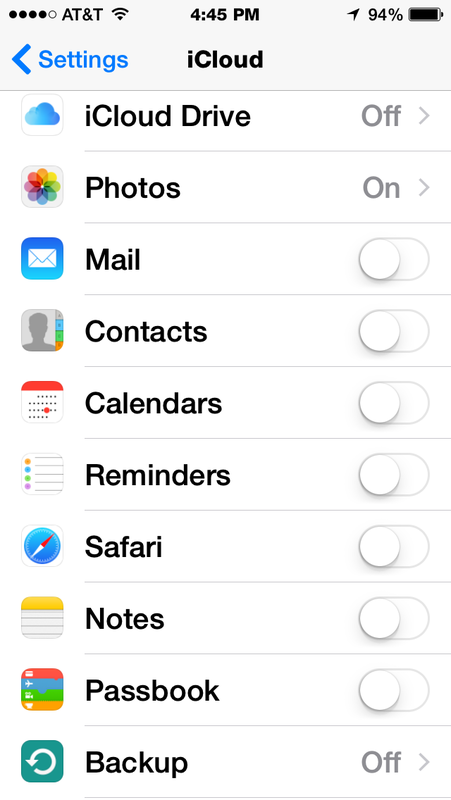 But you can switch it on in the Settings under iCloud > Photos. A pop-up alert warns you to back up your library before proceeding. Unlike with iOS 7, where the Photo Stream did not count against your free 5GB limit, with iOS 8, it does count and is easy to exceed. If you have more than 5GB of photos, you will have to set up an iCloud account for 20GB, 200GB, 500GB or 1TB for 99 cents, $3.99, $9.99, or $19.99 per month respectively (which you can cancel at any time). You don’t have to store your photos in iCloud, of course. There are many other alternatives, but iCloud has the ecosystem advantage of storing and syncing across your Apple devices and platforms. Because this is a beta, there were some glitches, such as a consistent recording of 4.88GB of photos and videos despite that I had removed hundreds of photos and all videos from my phone. But for the sake of experimentation, and spending a dollar for a good cause, I decided to purchase the 20GB of storage and opt to keep the high resolution images in iCloud. You might want to pass on iCloud Drive for the time being. If you are intent on doing some heavy duty photo editing on your iPad, for example, you might opt to keep those high resolution images locally on the tablet. 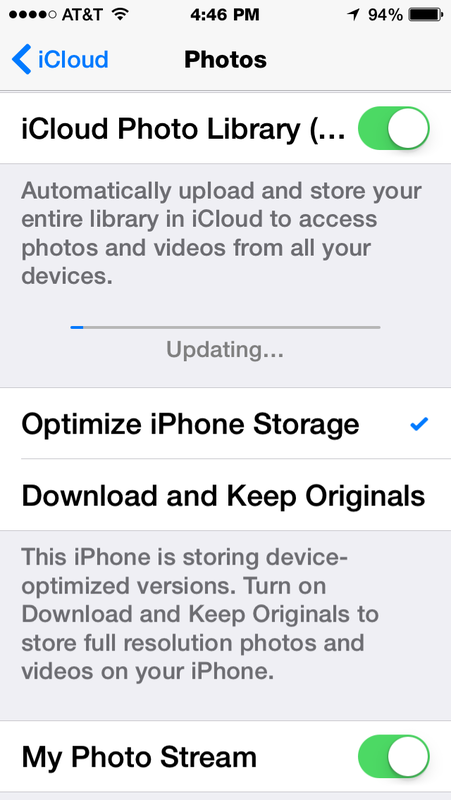 However, you can also work on the optimized images and count on those changes being applied to the original later in iCloud. Either way, it’s all good. If you’re one that likes to sync your iPhoto library via iTunes, think again if you plan to use the iCloud Photo Library, because it does not support iTunes syncing. Another component of the new iCloud configuration is iCloud Drive. However, since not all of my devices are running iOS 8, and I am still using the Mavericks operating system on my Mac, I decided to wait on the iCloud Drive, and I suggest that if you are in that situation, you do the same. Whereas iCloud Drive is forward looking, user success in configuring and using it depends on running the newest software in all venues, some of which is not available yet. The improvements in iOS 8 are vast and far-reaching and will likely take some getting used to. Personally, I think Apple could have salvaged the Camera Roll moniker, even if it wanted to change the definition of it slightly. Moreover, despite the name change, I suspect people will continue to refer to the top level Recently Added album as the Camera Roll, at least for awhile.